This Pitcher has a filter lid that will allow you to pour your water without letting fruit into your glass. This Pitcher is made from borosilicate glass which is lighter and stronger than regular glass, hand blown, heat-resistant and 100% lead-free. This Pitcher is nice looking and very useful. This Pitcher has a large capacity and looks great on your dinner table. You can make tea, milk, juice, ice water, or white sangria, or anything you can think, with this pitcher. Our glass is slightly heavier than others on the market ensuring both the feeling of quality and the longest possible durability. Please rest assured that use. ☆Straight Body Design, Save Space, when you put it in the cabinet or and other storage space. Borosilicate glass material, lead-free, 100 ounces high capacity, enough to serve your family or entertain your guests. Withstand temperature 0 to 300 ℉, stove-top safe, stays clear and heat resistant. Dishwasher safe, but hand washing is recommended. 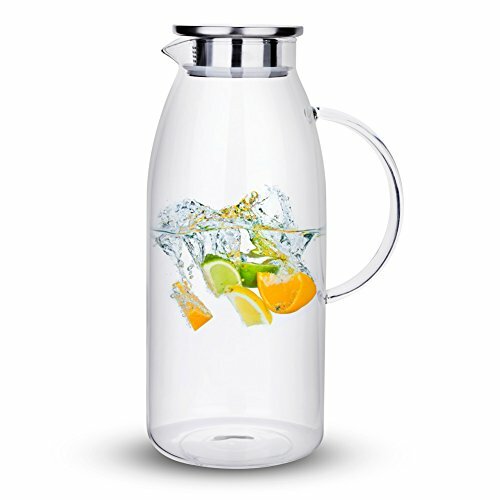 This pitcher can be used for many types of beverages from water, cold/hot water, iced tea and fruit infused juices etc. Note: Super high capacity, please pay attention to weight.